Find a wide range of fabulous flowers for any occasion at affordable prices only at What A Bloom. Available products include planters, roses, gourmet baskets, basket and vase arrangements, center pieces, premier collections, growers direct and more. Save 15% Off New Years Eve Centrepieces. No Deliveries 12/25/13, 12/26/13 or 01/01/14. Expires on 01/02/2014. Save 15% Off all orders. Offer valid 11/15/2013. Mothers Day is Here! Save 15% Off All Orders. Expires on 05/12/2014. 25% Off all Flower Orders over $50. Ends 12/31/2013. Get Mothers Day Arrangements starting at $39.99. Expires on 05/13/2014. Save 25% Off all Basket Orders. Ends 12/20/13. Get 1-year subscription to Chatelaine on Purchase of an arrangement over $50. Take 15% off your entire order. Offer ends 2/28/14. 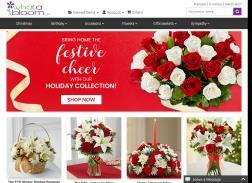 $10.00 off your purchase from What A Bloom!